Missed the quarterly gathering? Here’s a summary. – Becky from Westwood Hills Nature Center. One thing the Nature Center focuses on is the asset of “safety” after discovering from the young people who visit the nature center that having a safe outdoor experience is important to them. Becky has talked at a staff meeting about assets and why they are important. Then before the summer camps, she reminded staff about the importance of supporting kids while they teach about nature. She attached a list of the assets, highlighting the ones that their program touches. She includes 10 examples of how to connect with youth in their volunteer newsletter. Her ideas come from Search Institute’s “150 Ways to Show Kids You Care,” publication. – Bob from Nurturing Our Retired Citizens (NORC) wrote an article for the organization’s newsletter. He pointed out how teens and seniors are natural allies and how the rest of the population views them, (they dress funny, people worry about how they drive, etc.) He has talked to folks at Lenox Senior Center about events including promoting the Children First Ice Cream Social. He has also distributed copies of Search’s “150 Ways” to NORC board members. 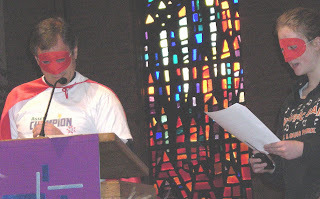 – Marjie from Aldersgate United Methodist Church kicked off activities with the Mayor, dressed in his red cape, and a teen member of the congregation, performing the “Asset Champion Man” skit at a Sunday service. (Photo above.) She has trained the church’s 8-member staff and provided training at the adult education hour. There is an Asset a Week in the bulletin. After 40 weeks, they plan to have someone share an asset example in their Joys & Concerns during services. They also had each member write a commitment to touch the life of a child on paper handprints. The handprints are posted in fellowship hall as a reminder to how many lives they can reach. This summer, youth will be paired with Faith Partner adults. These relationships will not be solely faith-based, but will work toward the asset of “Other Caring Adults.” She shared Search Institute’s book “What Young Children Need to Succeed,” written by Jolene Roehlkepartain that gives many practical asset-building examples. Jennifer runs the Aquila Service Club which began in 2007 with the vision of providing 1-3 graders an authentic service learning experience. This year the Service Club grew from 15 to 40! They have been meeting since late fall and have done many amazing projects. Their projects include making things for and spending time at Golden Hills Living Center, organizing and successfully carrying out a school supply drive for an orphanage in Honduras, cleaning the Aquila camps on Earth Day, and visiting STEP to learn about the wonderful services they offer residents of St. Louis Park. Lee-Ann, a teacher at Park Spanish Immersion, started a stepping dance group for students at the school that is comprised primarily of male students. Sarah from the City/School Volunteer Office, shared opportunities for people, young and old, to volunteer during the summer Parktacular celebration. • Children First Ice Cream Social, Sunday, May 18, 2-5 p.m. at Wolfe Park by the Rec Center. Volunteers are needed to help with set up and clean up, work at the Children First table handing out coloring books and scoop ice cream. • Parktacular Parade, Saturday, June 14, 11:30 a.m. – 2 p.m. Children First will have a convertible with people walking along side it handing out coloring books. Our super heroes have been invited to join us, and you’re invited too! • Dr. Peter Benson, President, Search Institute, presentation on his new “Sparks” research, on Thursday, September 25, 7 p.m. Save the date! • Healthy Communities Healthy Youth pre-conference session focusing on the Asset Champions Network will be held in St. Louis Park on Wed., November 5. This is Search Institute’s national conference and the first time they have offered an off-site session. Watch for more info.